For the opening of the Giambattista Valli store in London, Amal wowed in a Giambattista Valli lace burgundy jumpsuit which featured a ruffled neckline. She accessorised her lace number with pendant earrings and a gold clutch. They celebrated the opening of the first Giambattista Valli boutique in London with a dinner hosted by Edward Enninful and the “Valli Girls”, Bianca Brandolini d’Adda, Tatiana Casiraghi, Camilla Al Fayed, Giovanna Engelbert, Eugenie Niarchos and aatended by friends such as Amal Clooney, Naomi Campbell, François-Henri Pinault, Charlotte and Alice Dellal and Peter Dundas. I don´t like Giambattista Valli´s collection (Nati´s link), every dress looking like an old fashioned curtain. Amal would look better (i.e. young, fresh, dynamic) with a sharper look plus vivid colors than with ruffles and a brownish red, this outfit does nothing for her. Beautiful earrings by De Grisogono, the designer/owner Fawaz Gruosi is Lebanese too. I suspect the clothes, shoes etc she wears may be on loan from the fashion designers and she is providing the service of advertising for them. I had read that the outfit was designed for her so I imagine she just took it home. I thought it was lovely. She seems to look good in every color. Jackson, where did you read that the outfit was designed for her? Nati, was the jumper made for Amal? Paris- I read this information on one of the web sites about the designer. I imagine that Nati read it too or if she did not it is on one of the web sites. No big deal, right. Jackson – a bespoke outfit is a “big deal” because specially made for the customer, an outfit from the designer collection is not. Paris- I do not understand why a bespoke jumpsuit made for Amal is important to you. I love Giambattista Valli, he is really great in freshening up Haute Couture details. she has become a socialite. she’s not a lawyer anymore. K–you are going to continue to be “probed” by a certain person who likes (no thrives & enjoys) being combative & critical of EVERYONE if you do not see, think, talk, agree with everything THIS person says. So with this in mind, you might want to ignore them. I DO. This person does not exist to me, therefore, I have zero interest in ANYTHING said by this person. You might want to do the same. Again, I commend you for being BRAVE, honest in your approach…and keep in mind– some people just don’t get it! Meaning, you meant no harm, but rather had a strong desire to share your point of view in this context. There is nothing wrong with that, whatsoever. Stay BRAVE and be relentless in all you do. I am now officially tired of the Amal love fest…..she is a rich, entitled woman who spends millions on clothes, hair, makeup, jewelry, homes, private jets…etc. Everyone says she is supposedly some respected Human Rights Barrister. Well….then why doesnt she speak out against the crap that is going on in the United States right now. Thousands of children are being separated from their parents who are seeking help…this a Human Rights crisis. She has the power to do something…say something….have courage…be brave…. She does nothing unless she is wearing her million dollar outfits. She only talks when she has the perfect audience and a beautifully written speech. She talks about being brave….well Amal….BE BRAVE….. Please dont tell me she can’t…. Gabby Gifford continues to fight..despite almost loosing her life by a gunshot.. These are just two people that inspire and are Brave enought to speak out on this issue and many others…they dont flaunt their wealth and wear million dollar outfits. 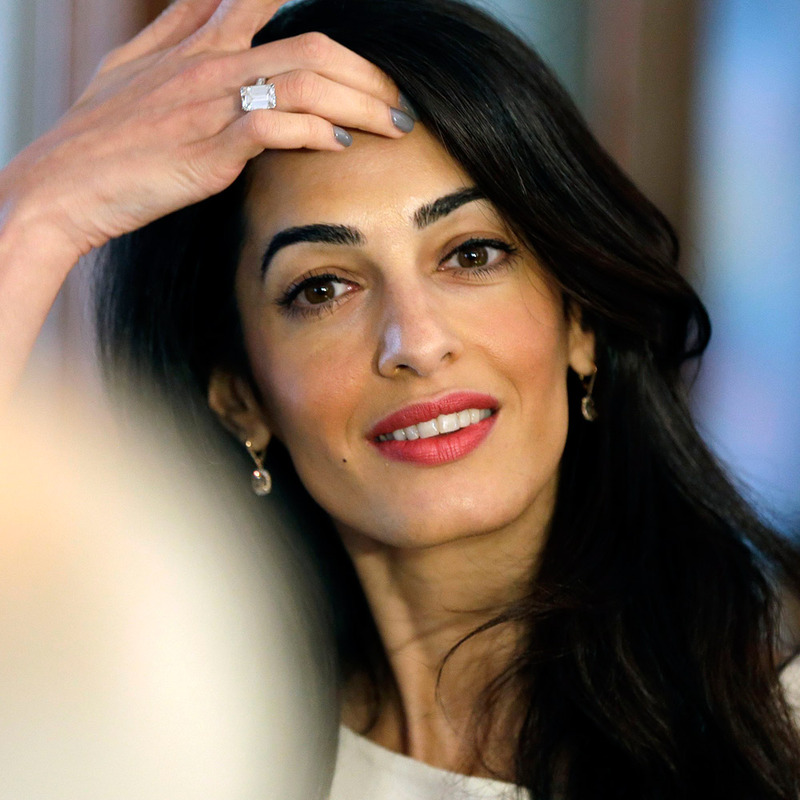 Amal continues to be MORE celebrity than Human Rights advocate. Fashion and being on covers of magazines seem to be more important. Her photo op buddy Nikki Haley is supposedly going to pull the US out of the UN Human Rights Council. Faahion is of little importance when the supposedly most powerful nation on the planet is being run by the idiot that is in the White House. This is my opinion…if you dont agree..I dont care..
America is falling back decades and it is a scary place to live right now. People that have power and the ability to do so…should speak up loudly… Amal has the power, knowledge and ability. I completely agree with you, K. I also wish she’d “be brave” about Palestinian issues. On LuLus point I agree with you about Palestine and how she said she’s too busy to be part of the war crime panel for that. She’s certsinly selective but let me play devils advocate it’s highly polictized and extremely dangerous- also her family are open anti- Israel so it will be such a difficult and dangerous task. @SOOS can you please help me meet Amal CLooney tomorrow at the Toronto Event. Do you know where she is staying? Aside from the immigration issue you reference, I think that Amal is still finding herself…she enjoys fashion and the celebrity life, but she also has this other side, which is the academic/serious side. This part of her writes books, speaks at the UN etc. I personally think that at some point she will decide on which of these paths she wants to follow… but,the fact that family arranged an introduction to a Hollywood actor, like George with a lavish lifestyle gives us a hint IMO. K – I understand your point, but in fact you ask Amal to be a different person, to be someone else: Amal cares for looking beautiful, being successful, living a fun/comfortable/glamours life and also for some good causes, which are compatible with her (and George´s) image and aspirations … Like most human Amal is no heroe, she stays her comfort zone (i.e. what feels not too challenging), this is something one should simply accept. Gee.. if America is that bad why dont you just move out!! Tired of these self-entitled anti-America “citizents” Go live somewhere else and you will see the difference. Why dont YOU go do something about it.. and tsart by understanding the “crisis” you are writing about because i dount you really know how it came about. I am fighting the fight against people like YOU . I have said what I’m going to say..
Praying for all the suffering children and their families. Thank you K, your infos are so important. Now we in Europe get information about this cruel seperation of children by the US government. But you can’t blame AC for this situation. Trump himself and people like him are responsible, yes – and all people who voted for him. They destroy everything. They have no respect for life and love. Everyone’s entitled to their opinion but what K and Lady appear to be saying is that Amal and George should be doing is what they feel they is important and implying that the work Amal and George are doing with their foundation and their donations in the US and elsewhere are not worthy of their time or money, or that Amal and George should be traveling around the world helping in all kinds of situations. I just do not get the criticism about people who are doing important work. I think we each select what we want to do. I do a very large tri-state animal event that raises thousands of dollars each year for two non-profits. That is where my money and my energy go. When asked why I do not do this or that or support this or that I always say that I raise a lot of money for animals in need. No one says another word. I hope Amal and George just continue to do what makes their heart sing. I think these are same shoes she wore to royal wedding Nati? I like this jumpsuit- the ruffle makes a fun detail. There are some negative people on this site that don’t seem to like Amal. This blog is for her fans and to see her fashion. I scroll past the comments section anymore because the negative people seem so angry with her. I would have to ask why do they even check in here if they don’t like Amal? But ultimately I don’t care for any reason they could give because I like Amal and that’s all that matters! Keep posting about this beautiful fashion icon Nati and we will continue to ignore the haters! First..at the top of the page..it says A Blog about Amal’s NEWS and Style. This blog is not just about her fashion, but what she is doing…..her works as a Human Rights Barristers and other things… I am responding to both.. I applaud Nati for her allowing me to disagree with people on this site . This is called Freedom of Expression. Here in the US, the Freedom of Expression and Freedom of the Press are under attack by the Idiot in the White House. I am so appreciative to Nati…the owner of this blog, for allowing me to express my opinions, even though they may not be liked by many . I strongly believe that people with power and influence should speak up about this topic and what is going on in Texas. I believe Amal has that ability…..It seems like every article that is written about Amal in all the newspapers/magazines, it mentions in some way that she is this “influential” HUMAN Rights barrister…out saving the world…..when she does talk, it is in these very controlled environments. Everything is planned and scripted perfectly….her fashion is perfect..and the speeches are lovely… I would love to see Amal use this so called influence to do something/say something about this Human Rights violation that is happening in the US. Now is the time to Speak Up and Be Brave that she has talked about that in her recent speeches. On anothe note…I am NOT a Hater. I care very deeply about what is going on in the world and the suffering of people that occurs on a daily basis. There are almost 2000 children separated from their parents in Texas, they are being kept in not so great environment….that NEEDS attention. I think people, like Amal, who have the knowledge and influence should be speaking out! I wont apologize for thinking that this topic is a lot more important than fashion. K- If you were just “speaking up about a topic” it would not belong here but on some other forum, perhaps a political forum where you could voice your opinions about topics in general. What you are doing and what I was critical of is your criticism about what YOU think Amal and George SHOULD BE DOING with their time and money, ignoring what they are doing. Both work, they have a family, they engage in civic activities, and appear to enjoy going to various events where Amal can dress up. You can of course speak up about the unfortunate situation or situations we have in the US and in the world but to criticize Amal and Geroge because they are not doing what you think they should be doing makes no sense to me but does make me curious how and where you spend your money and time. Perhaps you should go to Texas or spend timer at the border where families are being torn apart. That should be your focus in my opinion. K-you are entitled to your opinion and I read them with respect as I do with everyone else and stare my opinion back if I feel the need. K you make great general points – ur heart is in the right place – however I would suggest you take this energy and call out those representing us that hold POLITICAL power – those who we have voted in state by state. Those people have an obligation to not only hear you but also take action. Amal and George are doing 75 percent ( estimate) of things they are not required to do as part of their day jobs as entertainment and legal professionals in their respective fields. I also ask that Amal use her voice for issues in Amman, Lebanon and Palestine where she has direct connections and knowledge . She has a voice and a CHOICE. I respect her if she does and equally respect her if she doesn’t. What’s happening in Texas is sad- speak up K ! Use the right forums – and vote out those people who have given us lip service year over year. K thanks for your contribution here. We respect you and your opinions. Soos – I agree with your comment. Jackson….I do as much as I possibly can….phone calls, protesting, donating, voting, etc…but I dont have the means to just pick up and go down to Texas. If I could, I would. I dont have an army of nannies to care for my children or housekeepers and assistance to take care of my house and personal needs. I have a job that I have to go to… I dont have a private jet to zoom me to any place I want to go. I dont have millions of dollars, nor do I have noterity or a degree in Human Rights law. I, unfortunatly live in a Republican Hell state….I do what I can and am involved in my community as much as I can be. It seems Amal speaks when it is convenient for HER and when it is going to give HER the most attention and praise. It is always about HER … This is my opinion…there is something very fake and self serving about it…again my opinion. I am not asking for you to agree with me. Let’s see what happens this week when she speaks in Canada with her Father In Law. I guarantee you that she will be wearing the perfect outfit, with perfect hair and make up, and will have a perfect speech, words and/or talking points written down. Let’s see if she says anything about what is going on in Texas. If she does, I guarantee you that every news site and magazine will have some article or headline that will read something like “Renowned Human Rights barrister comdemns the caging of children”… Etc…..
..SHE will have gotten all the publicity to make herself look good…when she could of been speaking out today or yesterday or last week. I saw the pix and that deep wine colored gown was outstanding on her. The color, fabric texture and style were perfect on her. She does well with classic styles IMO. I wonder if the photos were airbrushed- particularly on her face- as she looks (facially) so much better in these photos versus the ones taken at the AFI. I agree. While burgundy can be a great color, and I own some great burgundys, this is an ugly brownish red in lace fabric with a one shoulder ruffle and awful baggy waist pleats. It is not attractive on Amal at all – very figure unflattering. As far as her being brave, everything with the Clooney’s is planned. Being brave is about putting yourself in a position to standup against authority against the norm but Amal plays it safe in the cases she publicizes to keep her “approval” high and build up her fame and celebrity. Their invitation to the royal wedding in the UK was no accident nor was it due to Amal’s supposed “friendship” with Meghan Markle. She and Baria decided that since Amal is good as “royalty” that she deserves to be there so they made it happen. Her hideous pants dress at the met gala was planned last minute too. The minute the queen, at the influence of Anna Wintour, dubbed Quinn with fashion awardthe award, Amal decided she needed to have him make her dress because the royal family approved of him. This was Nooooooo accident….all well thought out and manipulated….Anna Wintour has asked her many times about being featured in vogue but it was all intentionally planned out to occur just before the Met gala….nothing wrong with thar but good manipulation of the media. She prefers to spend her time and energies enhancing her celebrity status rather than on the major issues. I can see her asking herself “what pro bono cases should I select to makes me look like I’m doing something of substance in the public eyes.” It’s all about public image rather than being genuine and doing things from the heart. We are seeing her now at many more celebrity, socialite, fashion and paid speaker events rather than at legal-political meetings of substance. She only needs to pop up every now and then at a UN meeting to give validity to her celebrity. She’s gone from being a human rights attorney with some socializing to primarily being a socialite who dabbles in human rights law just to give herself credibility in the public eye. That’s why she doesn’t stand up for the biggest issues out there. It’s all about creating the public perception of having the greatest live that ever existed and being the greatest human rights attorney that ever lived…..blah, blah, blah….while shoeshe focuses on what really matters to her – fashion, money, fashion, narcissism, fashion. Angela- Please share with all of us where you continue to get your informations about Amal. It is so critical. Who is feeding you the information that you continually share with readers? It sounds like you make it up so please do tell all of us where you get all of your information. These are my opinions just like the opinions others have on this blog. See definition of opinion in the Webster’s dictionary. Furthermore, I’ve listened to you for quite some time on this blog repeatedly attacking others for not being inline with your biased opinions. Now you’ve decided to find a new victim. The way you behave on this blog is, I don’t doubt, the way you behave in real life. It’s very very petty and you seem to have a lot of extra time on your hands since you not only defend Amal as if you are being paid to be on her side or are a related to her, but you also seem have little else in your life to be passionate and happy about. You accuse others of the bigoted behavior that you yourself are, in fact, guilty of. If the owner of this blog does not want the diversity of opinions then she should establish some written rules. But you are NOT in charge of policing this blog so keep your attacks restricted to those who enjoy being your victims!! Angela, I agree completely with your comments. Nati, thank you so much to let commenters express their opinion, even if the comment is not always “positive”. Amal is certainly a multifaceted person, she is highly attractive but also very controversial. I like to read the positive and the so called negative comments, also the discussions. Of course, haters and trolls should not be allowed to post comments, they are against human rights. Someone who is critiquing Amal’s fashion or even Amal’sbehavior is not someone who is automatically against human rights. One could dislike the behavior or presentation of a doctor or a judge, but still place great value on the benefits of the health care system and have great respect for the law. Angela – criticism is acceptable as comment, but not hate, which is something very different and should never be allowed, this is what I tried to express in my previous comment. Haters are against human rights? That‘s nonsense! Sinery – Human rights include among others freedom of opinion and expression, which haters and trolls can´t tolerate, they try to suppress any different opinion. If you disagree, please explain! The only issue I have is your description of Amal being “highly attractive” which is highly debatable. She definitely thinks she is.. though. Cat – Amal is seen as (highly) attractive by many commenters on this blog, also by many media (Vogue etc.) and by the many new „friends“ she got after her marriage, not to mention old friends, her family and George … this is a fact. ‘Beauty is in the eye of the beholder’, i.e. the perception of her physical and character attractiveness is subjective … therefore debatable, which this is true for all human. She has the right to think positively of herself, you and I we have the same right – all human have this right. Without knowing her personally, I am sure that like all human she has some positive and also some negative character traits … what is predominant? Don´t know her, can´t judge. As for her face and body, again: ‘Beauty is in the eye of the beholder’ . Paris, I still don’t agree with you. You seem to suggest that because, other people, including media (of which positive opinion can be purchased) and her family and friends (c’mon) think she’s attractive, therefore she’s attractive. I only agree with “she has the right to think positively about herself.” Yes, very true. However, there is a canyon of a difference between a healthy self-esteem and her coy, coquettish, attention-getting ways. She is so vain, but I am really at a loss as to why, as she’s not a beauty. ‘Beauty is in the eye of the beholder’, i.e. the perception of her physical and character attractiveness is subjective … therefore debatable, which this is true for all human. She has the right to think positively of herself, you and I we have the same right – all human have this right. Without knowing her personally, I am sure that like all human she has some positive and also some negative character traits …what is predominant? Don´t know her, can´t judge. As for her face and body, again: ‘Beauty is in the eye of the beholder’ . Stunning always in the “red” jewel tone colors. Is Amal still practicing law?? It just seems she is doing more socialite/fashion designer types of gatherings than daily legal court cases. She never struck me from the beginning that she would get caught up in all the fashion/socialite/celebrity gatherings as much as she has over the past few years. I was thinking she was more career oriented and thought she would make that more of her signature. It’s okay, though. Lovely head shot picture of her! It’s a great photo; make up perfection and pretty hair style choice and stunning color.